1/2 tbs Thai red curry paste. – Prepare the ready to roll puff pastry as instructed on the package. – Preheat the oven at 180 Celsius. – Put the minced pork, chilli, coriander, onion, sugar, oyster sauce, fish sauce, Thai red curry paste, salt and pepper into a mixing bowl. Then, use your hands to mix all ingredients until all the ingredients combined. – Unfold the puff pastry sheet on the flat worktop. Lay the sausage mixture into a sausage shape( approx 2 cm diameter) on the pastry sheet. Roll the pastry sheet to wrap around the sausage mixture. Trim the puff pastry sheet and press down the edge to seal the join. -Repeat the same procedure until you finished all the pastry and mixture. -Use the sharp knife to cut the sausage roll into the bite-size (width way). -Brush the sausage roll with melted butter. -Bake for 20 minutes then takes the tray out. 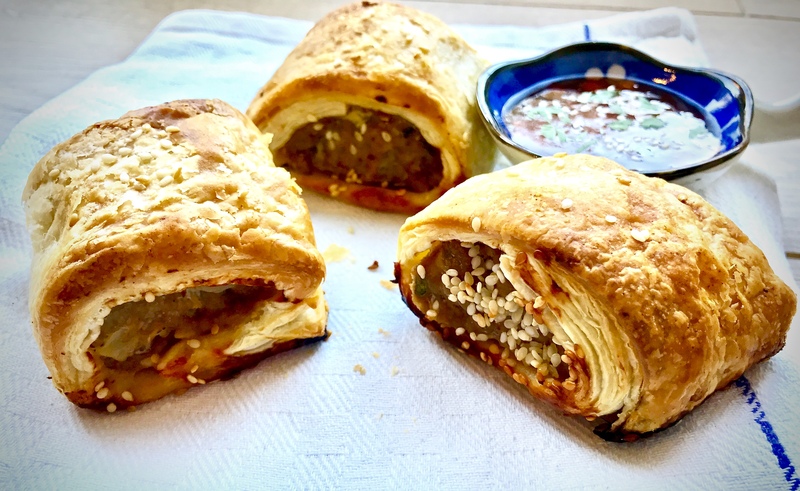 -Brush the sausage rolls with butter again and sprinkle the sesame seeds on top. -Bake again for further 5-10 minutes or until the pastry puffed up, golden in colour and cooked. Enjoy Thai Sausage Roll hot or cold. -Try to get the minced pork from your local butcher as it often contains less water which will reduce the chance of socky bottom! 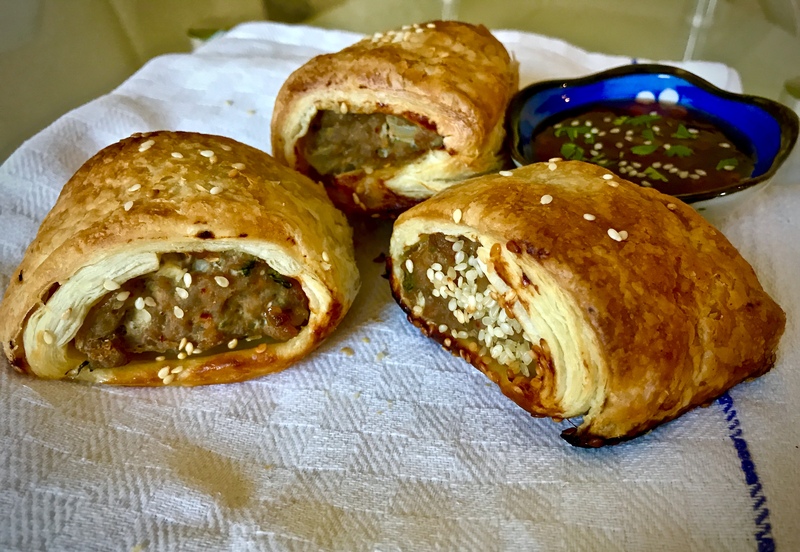 -I often have Thai Sausage Roll with the Sweet Chilli Dipping Sauce and a cheeky glass of cold Thai beer.